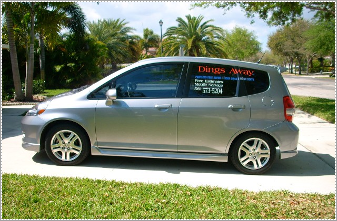 Dings Away is a locally owned and operated company that provides mobile service to your home or office in Palm Beach and Broward County. Our primary service is the removal of minor dents & dings through the process of Paintless Dent Removal (PDR). We serve a growing number of loyal customers each day and we are committed to continuing the highest level of customer service and satisfaction. Dings Away has been exceeding customers' expectations in Palm Beach and Broward County since 2001. We have been perfecting the dent removal process since 2001. Dings Away is locally owned and operated family business. It is this wealth of experience along with our passionate desire to be the best craftsmen in our field while providing the best customer service possible that set us apart. We welcome the opportunity to earn your trust while showing you what we do best, should you have the need. Dings Away can repair everything from door dings and small dents to minor fender benders-as long as the paint has not been cracked and the metal is not creased or crimped. It’s called Paintless Dent Removal, and no one does it better than us.